Description Excellent opportunity to purchase a freehold site comprising of a former electrical sales shop know as Thorne Television, a brick built derelict building to the left fronting King Street (former car repair business with living accommodation above), a large private carpark and further workshop/outbuilding. The total frontage of the site including Thorne Television and the derelict building and King Street side access is approximately 22.8m. The depth of the site including buildings and carpark is approximately 34m minimum extending to approximately 42m including the workshop/outbuilding. 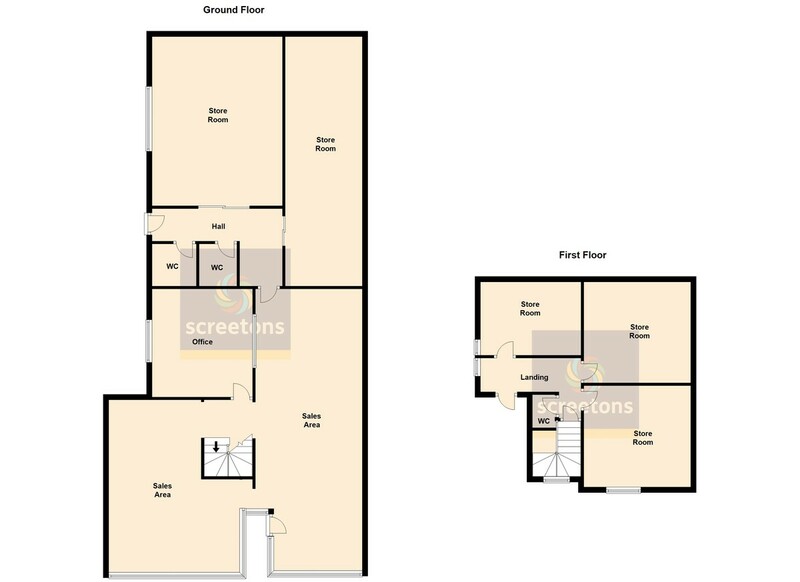 Offering excellent scope for development subject to necessary planning permission. The following dimensions are for guidance only due to the limited access to buildings and some parts of the site. SALES AREA (LEFT SIDE) 13' 6" x 21' 1" (4.14m x 6.43m) maximum Large glass window frontage to king Street. 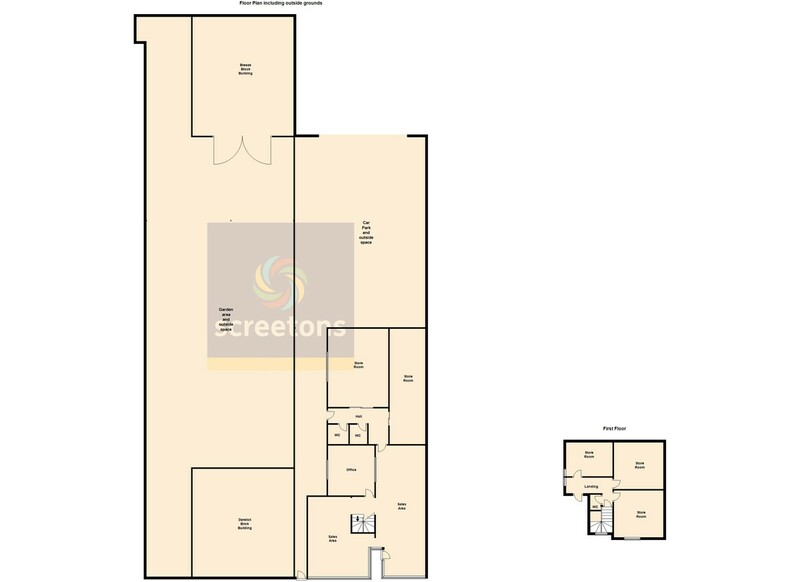 SALES AREA (RIGHT SIDE) 10' 6" x 33' 8" (3.22m x 10.28m) minimum With large glass window frontage to King Street. Main entrance door from King Street. Staircase access to the first floor, door to office and access to rear entrance corridor which in turn has access to both store rooms. CURRENT OFFICE 12' 11" x 11' 10" (3.95m x 3.61m) Open window to sales area. REAR ENTRANCE CORRIDOR With pedestrian door/delivery access from the private rear carpark. Doors to both W.C's and doors to both store rooms. STORE ROOM 9' 3" x 29' 10" (2.82m x 9.11m) Located to the rear, right hand side of the building. STORE ROOM 15' 6" x 20' 1" (4.74m x 6.14m) Located to the rear, left hand side of the building. FIRST FLOOR Former living accommodation which could be easily converted back if required. HALL With re-inforced door to roof area. FRONT STORE ROOM 12' 0" x 12' 0" (3.67m x 3.67m) Front window facing King Street. REAR STORE ROOM 12' 0" x 12' 11" (3.66m x 3.95m) Rear facing window. REAR STORE ROOM 8' 9" x 11' 9" (2.69m x 3.59m) Side facing window. PRIVATE CARPARK 49' 2" x 38' 0" (15m x 11.6m) Immediately behind the building and vehicular access is via The Green. BRICK BUILDING FRONTING KING STREET 27' 10" x 26' 2" (8.5m x 8m) Measurements are approximate and taken externally. Large car park to the rear of this building with access from King Street leading to the large workshop/outbuilding. LARGE WORKSHOP/OUTBUILDING 30' 6" x 25' 11" (9.3m x 7.9m) Dimensions are approximate and taken externally. This building is positioned at the bottom of the car parking area to the derelict building. EXPRESSIONS OF INTEREST Our client is open to offers via the expressions of interest route, as we appreciate that any offer made could be subject to obtaining any necessary planning permissions, depending on what plans a potential buyer may have for the site. If an offer and terms are accepted by our client they will be happy to proceed subject to contract and subject to planning permission being obtained before completion takes place.